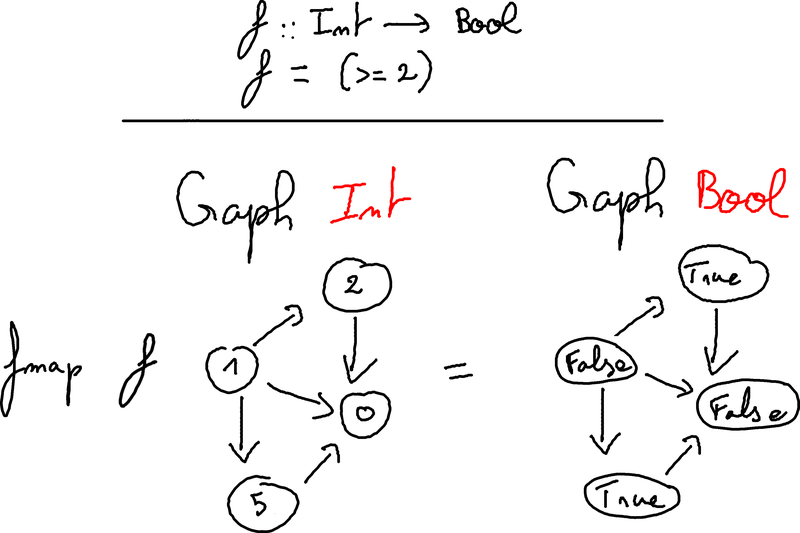 Here you will learn the basics of Alga, an implementation of an algebra of graphs. Every given examples is runnable, so please feel free to install alga (with cabal or stack) and have a GHCi console near you if you want to try the code. All you need to have is inside the Algebra.Graph module. Don’t hesitate to have a look at the module documentation if you want more informations. If you encounter any bug (I hope you will not), please open an issue at https://github.com/snowleopard/alga/issues/. Graphs are traditionally defined as a pair comprising a set V of vertices and a set E ⊆ V × V of edges. This is great when working with traditional imperative languages, but leads to some problems when trying to use it in a functional languages such as Haskell. You have an only way to construct the empty graph, using the constructor Empty which does not take any argument. You can construct a graph from anything, transforming it in a single vertex using the constructor Vertex. You can overlay two graphs, that is just to put them next one to another. You can connect two graphs, that is drawing an edge from each vertex of the left side to each vertex to the right side. Simple, no? … Well ok this is not a standard way to see a graph, but don’t worry, you will get used to it. Just remember: The only way to create edges is using Connect. This definition allow us to deal with directed graphs: An edge from vertex 1 to vertex 2 is NOT the same than an edge from vertex 2 to vertex 1. A triangle, with an edge from vertex 0 to vertex 1, an edge from vertex 0 to vertex 2, and an edge from vertex 1 to vertex 2 can be viewed as Connect (Vertex 0) (Connect (Vertex 1) (Vertex 2)). Don’t worry, there are some shortcuts. This means that, in a context of a Graph, we have Vertex 1 == 1, which is quite useful! Do you see why alga is an implementation of an algebra of graphs? There is a lot of maths here! No please don’t run away like you have seen a zombie in a graveyard! Don’t worry, this is not-so-difficult math. We will use the (+) and (*) notation, but these laws are true even when dealing with any graphs. Do you remind when you have discovered that you can mix + and * in the same equation? This is the same thing here! either you are connecting 1 to 2 and 3 “overlayed“. or you are overlaying the two edges (1,2) and (1,3). Whew, this is done we can make a step forward. Is the definition usable? Can we represent every graph in alga’s representation ? Let’s try to answer this important question. As said, graphs are (almost all the time) defined as a pair V of vertices and E ⊆ V × V a set of edges. 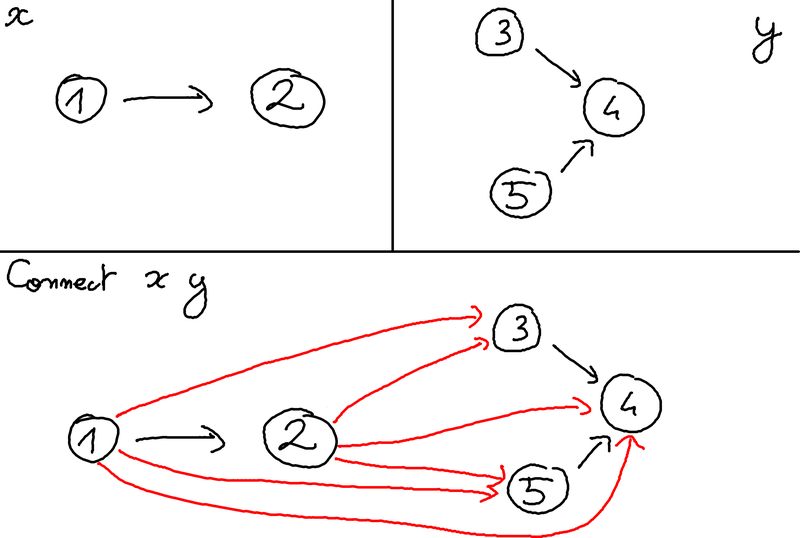 So to prove that we can represents any graph, we need to define a function create :: [a] -> [(a,a)] -> Graph a that create a graph from this standard representation. So we have defined the desired function, thus we can safely use the alga’s definition! In other words, the foldg function take a base case for Empty graphs, something to transform a Vertex and combining functions when we encounter Overlay or Connect. Still not convinced? Let’s try to build an induced sub-graph. An induced sub-graph is a sub-graph that “forget“ about some vertices and all edges to and from these vertices. So we are going to code the induce :: (a -> bool) -> Graph a -> Graph a function. We will use foldg of course. Then if we encounter a vertex, we need to verify if it satisfy the predicate. If it does not, we will simply replace it…Let’s say by the Empty graph! (Connect (Vertex u) (Vertex v) `isSubgraphOf`) . To check if a graph contains an edge from x to y, you can remove every vertices different of x and y, and then check if the edge alone is a sub-graph of the induced sub-graph. Note that hasEdge is requiring an Ord instance because isSubgraphOf is requiring it. Fortunately, you don’t have to bother with the internal definition since the Eq instance (which provide (==)) take care of this problem for you. For the moment, one can mess the internal structure, and the equality loose its meaning (ie ∀(f : Graph A → Graph B) : g = y ⟹ f g = f y does NOT hold ). Of course, you have Graph equality, and you can show a Graph. Alga can also export to the DOT file format through the Algebra.Graph.Export.Dot module. Compare the number of vertices. In case of a tie, continue. Compare the sets of vertices. In case of a tie, continue. Compare the number of edges. In case of a tie, continue. Compare the sets of edges. Alert! Alert! Haskeller’s alarms are ringing! If there is a Functor instance, is there a Monad one? You can convert anything into a graph, simply by transforming it in a single vertex. 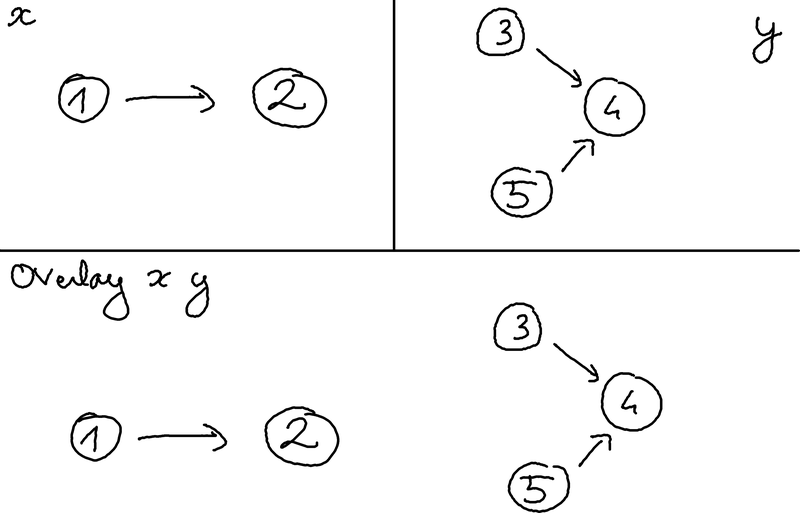 Moreover, if you can produce a graph from a type a then you can replace every vertex of a Graph a with the result, transforming it into a Graph b.
Graph can be a valid Foldable and a valid Traversable instance, but these are not defined in the Algebra.Graph module. The reason is that these instances are not compatible with the rest of the library. 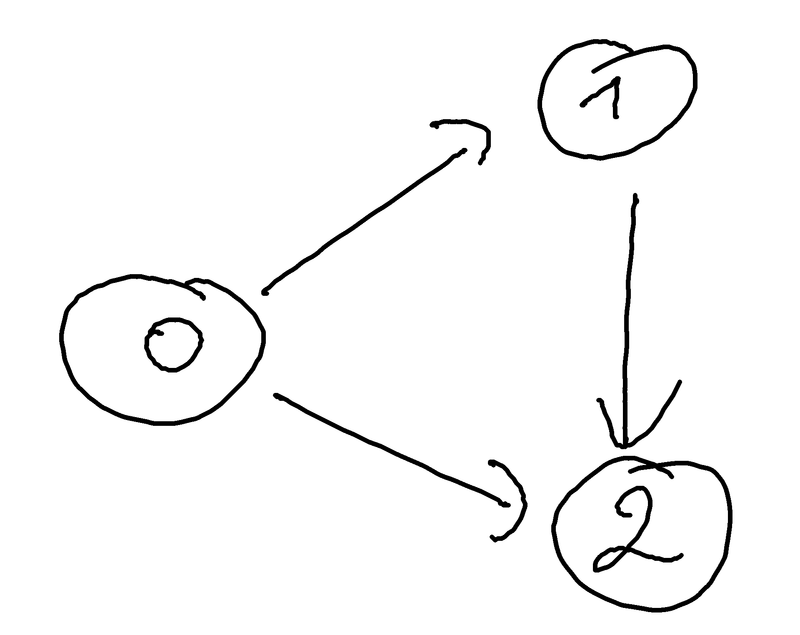 For example, vertexList g /= toList g because a vertex can be multiple times in the structure. Ok, now we are wanting to build something real with all of this. Let’s say a social network: one can represent them easily through graphs. The marketing team analysed the market, and decided to make something “à la Twitter“. The vertices will be users, and an edge from x to y will denote that x is following y. Your company is looking to have many users, so maybe the ConnectU is not very wise. In fact, adding a (Connect (Vertex a) (Vertex b)) is not very alga-friendly. If a is connected to 100 people, then Vertex a will be 100 times in the representation! The modified function will take longer to add a connection (foldg has a complexity of O(n)), but you will ensure that your graph will not grow too fast (if and only if there is not multiple Vertex a hidden in the representation). Viewing that you implemented your function very quickly, you are being asked to help one of your co-workers on his function. He was working about the getFollowing :: User -> Graph User -> [User] function. One possible way is to use the edgeList :: Ord a => Graph a -> [(a,a)] function. numberOfConnected = fmap (length . filter id) . foldg (pure Empty) (fmap Vertex . isConnected) (liftA2 Overlay) (liftA2 Connect) .